NIrV, Adventure Bible for Early Readers, Purple, Full Color by Lawrence O. Richards was published by Zonderkidz in June 2014 and is our 3645th best seller. The ISBN for NIrV, Adventure Bible for Early Readers, Purple, Full Color is 9780310727446. Be the first to review NIrV, Adventure Bible for Early Readers, Purple, Full Color! Got a question? No problem! 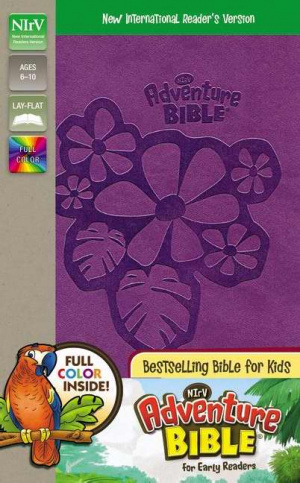 Just click here to ask us about NIrV, Adventure Bible for Early Readers, Purple, Full Color. Hi! I was wondering if you could recommend a case to go with this bible? Thanks! A:Perhaps this one? https://www.eden.co.uk/shop/butterflies-purple-luxleather-bible-cover-4284179.html Thank you for using the Q&A Forum.